Sudan has suffered a third day of violence, with gangs of southern Sudanese and northern Arabs attacking each other with clubs and Kalashnikovs. At least 84 people have been killed in the capital Khartoum since the death of southern leader John Garang. The violence has also spread to the southern town of Juba, where 18 people are reported to have been killed. Leaders of both sides have urged calm, and have agreed to set up a joint inquiry into Garang's death. But correspondents say there is a real danger that a much-vaunted peace deal ending two decades of civil war could be shattered by the sudden violence. Sudanese security forces used tear gas and flew a military helicopter low over Khartoum city centre on Wednesday in an attempt to quell the bloodshed. Traffic jams blocked the roads as residents tried to flee. Red Cross observers visited morgues and said they had seen the bodies of 84 people - northerners and southerners - slaughtered in the violence. They had been killed by gunshot wounds, clubbed to death or set upon in their cars. The violence was sparked by Garang's death in a helicopter accident, announced on Monday. Angry southerners went on the rampage, and northerners have replied with revenge attacks. 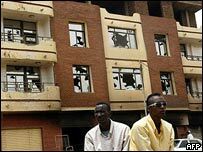 More than 800 people have been wounded in the clashes, which are the worst in Khartoum in years. Anger also erupted in Juba, 1,200km (720 miles) south of the capital, where witnesses and officials in Garang's SPLM movement said 18 people have been killed. 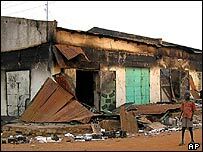 They said southerners had attacked and burned down Arab-owned shops and had killed northerners and chased them through the streets. Northerners - many of whom have lived in the south for decades - are said to be packing up and leaving the city. Both Sudan's President Omar al-Bashir and Garang's successor, Salva Kiir, have appealed for calm. They said they believed the crash was accidental, and announced a joint investigation. UN envoy Jan Pronk says there is no reason for people to believe Garang's death was anything other than an accident. "But there are some leaders, imams and others who are making irresponsible statements," he told the BBC's Newshour programme. Garang signed a deal to end 21 years of civil war in January and was sworn in as vice-president of Sudan three weeks ago. Mr Kiir has been chosen as new leader of the former southern rebel group, the Sudan People's Liberation Movement (SPLM), and is expected also to become vice-president of Sudan. On Wednesday US envoys met Mr Kiir, who told the BBC "nobody wants war" and reiterated his commitment to the peace process. Garang is due to be buried in the southern city of Juba on Saturday, after his body is taken through other key towns in southern Sudan to allow supporters to pay final respects. Local media say President Bashir is expected to attend the funeral.